Suffolk County Crime Stoppers and Suffolk County Police Sixth Precinct Crime Section officers are seeking the public’s help to identify and locate the man who stole electronics from a Medford store last month. 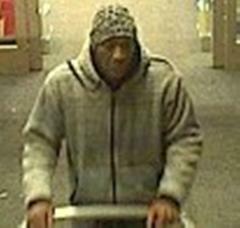 A man stole televisions from Target, located at 2975 Horseblock Road, on two separate occasions, on December 8 at approximately 11:18 p.m. and again on December 12 at approximately 11:30 p.m. The suspect was described as a dark skinned male wearing a brown hat, gray sweater and jeans.